LogMeIn Pro enables you to access work PCs securely over the web from anywhere with an Internet connection - at home, on the road, at customer sites or on vacation. Work as though you were right in front of your computer. It will virtually access your computer desktop, applications, files and network and print remote files and forms to a local printer. LogMeIn Pro also moves the files you need between PCs quickly with file transfer and file sync. Instant access to your remote PC from anywhere with an internet connection. Hear email notifications, check web based voice mail or listen to music and podcasts from your remote computer. Seamlessly drag and drop files and folders between connected PCs. Move files quickly between PCs. Automatically print files from your remote PC to your local printer. 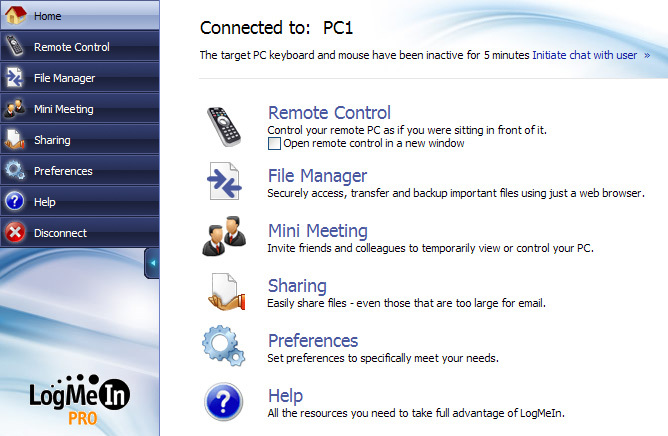 Invite a colleague or friend to your PC for an online meeting; view only or full control. Share files or photos instantly with others, even those too large for email. Synchronize files and folders on both PCs in seconds. Access drives on your remote PC as if they were local. Save time and clicks by going directly from the My Computer's page into a remote control or file transfer session. Qweas is providing links to LogMeIn Pro 2011 as a courtesy, and makes no representations regarding LogMeIn Pro or any other applications or any information related thereto. Any questions, complaints or claims regarding this application LogMeIn Pro 2011 must be directed to the appropriate software vendor. You may click the publisher link of LogMeIn Pro on the top of this page to get more details about the vendor.